We all know that Microsoft is striving hard to climb the ladder in the smartphone domain. While acquiring the Nokia business was one aspect, it also seems to have major revamp plans for its Windows Phone platform. According to prolific Russian blogger Eldar Murtazin, Microsoft, which is working on the Windows Phone 9 OS, would have a new UI which would forever replace the perturbing Metro UI, which hasn’t gone down well with many users. Further the new version is expected to be released in the third or fourth quarter of 2014. 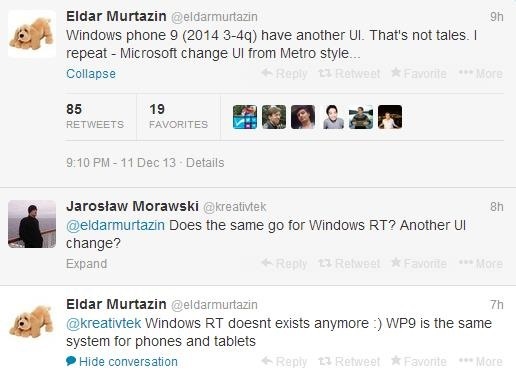 Interestingly, Murtazin valiantly claims that Windows RT would be replaced by Windows Phone 9 as well. This could be true considering recent reports of Microsoft planning on merging the Windows 8 and the Windows Phone 8 app stores. Microsoft also has plans to start offering free versions of the platform in order to increase the adoption rate. With all these advancement, Windows Phone could easily beat iOS within three years as predicted.